Which programs need to be installed? Before installing a software program, you have to check whether it is useful for your system or not. After the task check the program whether it’s working in the background without informing you clearly or not. This is the main important case except in antivirus materials, but some applications. After you closed the program, then again its working, you have to check memory usage from task manager. If it's not needed you can close from there by right-click and click to end process tree. Some randomly changing screen savers taking some amount of memory which may cause slow speed problems and it depends your PC configuration. When you need to work with high memory usage programs, it should be inevitable, at the same time your PC must retain actual speedy performance and healthy for a smoother workflow long time. Is it better to save more files on the desktop? I can suggest you to not to save your own private or non-private files on your PC desktop. You can save it into other drives except your system drive. It is a common method which can do any user for a smooth PC workflow. What are the other symptoms which could decrease your PC performance? On browsing time or by software on a PC can generate temporary internet files, cookies, history, which depends on the occurrences of programs generating in the PC. It depends on the programs and because of operating system concern. Those created files numbers and sizes may vary with respect to the loaded programs technology. Temporary files needed to be cleaned by external software programs (manually difficult and impossible) whenever your PC reached in slow response. It can save some space in hard disk too. Similarly, you can disable any non needed windows services or special programs manually if you are an expert. Soft Cleaner is a highly powerful software program which helps you clean and speed up PC within some seconds. It provides a regular lasting speedy performance after running the program. It will clean temporary internet files, cookies, history and other unused auto generated files from the PC. It is easy to use and faster processing with inbuilt cleaning, optimize and speed up methodology. By cleaning the surfing history too you can see a better faster surfing experience in your PC. Results better and faster access of any files including media, PC gaming programs and other sytem resources. Decreases the slow or inaccurate responses from mouse, keyboard and other software. What are the Inbuilt features specific? The inbuilt feature provides a clear methodology on analyzing files by showing its path, length, creation date and time. It cleans various unused auto generated files by browsing, system and other programs. It included a powerful memory optimizer, a powerful cleaner for unused files from various browsers and other programs with a speed up engine without touching any of your private files. It's highly delivering your online privacy. How to use Soft Cleaner? Start Soft Cleaner. You can see "Start Soft Clean System" button at the bottom left side of the interface. Click on the button, you can see main interface to running the process. From there, Live Analysis, Options, Soft Clean, Close buttons on the bottom side. The options window specifies various methods of cleaning procedure. Inbuilt methodology selected boxes showing that, it is important for a PC user for the cleaning process. You can easily select to those boxes which are not automatically selected for the cleaning process beneath to the automatically selected boxes. After selecting all options click on "Live Analysis" button to see the files needed to be cleaned. Soft Cleaner will automatically verifies and shows specifically the files to be cleaned. It is analyzing speed is much higher. Next, you have to click on "Soft Clean" button to clean those unused files. The cleaning strategy is much faster and high standard. Each time it's not needed to see the whole files name and details whether you need a direct clean, so you can do a direct clean with selecting all options. After cleaning, you can check PC speed by working with any programs or browsing or according to your need. You can see a better and optimized speed PC performance than before. 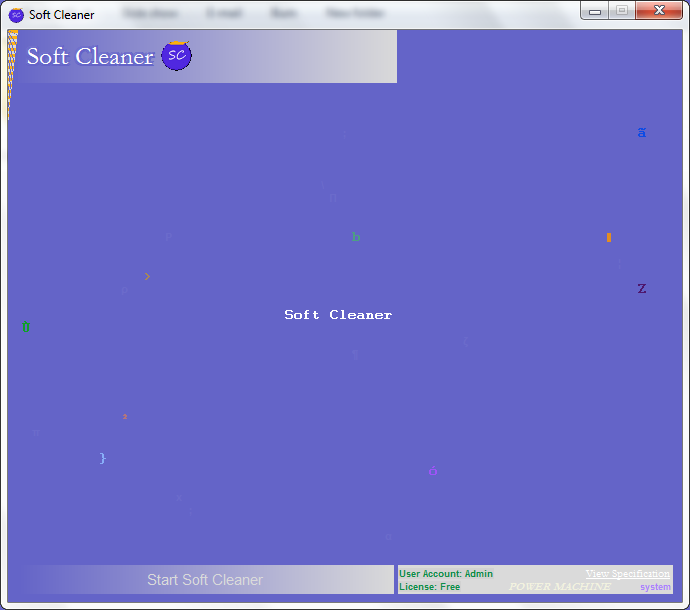 Will Soft Cleaner optimizes the system automatically at start up? You should work Soft Cleaner manually whenever the system need speed performance. Once optimization completed it doesn't need for a long time or it depends on the work loads of the system. Can i close after system optimization? Yes, you can close after system optimization and continue your work. How can i check that Soft Cleaner speed up my PC? After working with Soft Cleaner you can simply check the PC speed by accessing drives, files or any slow (before heavy PC load) software programs. You can simply browse over the internet and check how fast it accessing the web than previous stages. Make sure you have to close all opened programs manually for accurate PC speed up with Soft Cleaner. FAQ. Copyright 2012-2019 satheeshsoft. All rights reserved.